Markets around the world sank overnight. England's banks were all down on Monday some nearing ten percent and Asian markets took a massive beating. The Hang Seng Index plunged 5.2 percent and the Nikkei fell 4.5 percent. While the dollar hit a 13 year low against the yen, the lowest since 1995 and a record low against the euro. This was the result of the Feds aggressive, unexpected moves over the weekend while no one was looking. "Before the markets opened in Asia, the Federal Reserve lowered the discount rate it charges on direct loans to banks and set up a new program to provide cash to a wider range of financial firms, using tools it has not used since the Great Depression." Alarming news as tent cities are springing up in California and food prices across America are climbing more than twenty four percent. The comparisons between 2008 and 1929 have been rampant in the news. Make no mistake this is their warning, their predictive programming, to get you use to the idea so when it happens you won’t question why or how. Ben Bernanke, the Fed chairman said he took such aggressive moves to "provide financial institutions with greater assurance of access to funds," in the wake of the collapse of Wall Street's fifth largest investment bank Bear Stearns. Thursday Bear was worth over 6 billion dollars and on Friday there was a run on the bank and its value quickly declined to 3.5 billion dollars. Bear Stearns was ready for bankruptcy and the Fed agreed to back them up. Although they could not lend them the cash to stay alive it could use JP Morgan as a bridge. But as soon as the Fed offered the loan they seemed to have called it in within 24 hours, and JP Morgan Chase & Co announced that it would steal, I mean buy, Bear Stearns for $2 a share, valuing the U.S. investment bank at about $236 million, Less than the cost of the building! The bank fell apart so quickly, at its peak Bear Steans was selling for $171 a share just over a year ago, January 2007. The Fed forced this transaction and now to ease worries they opened up these types of loans to all investment banks like Bear Stearns, the set up is in place and the consolidation of America's banks has begun. This is the big story today, the historical choice for the Fed to open the discount window to more banks, (the place banks go when they’re in trouble) a sure sign that more trouble is on the way. Tomorrow the Fed will meet again and more extreme cuts are expected. Even though these rate cuts have caused us unbearable inflation the MSM is still heralding the Fed as the savior of the Global economy. The big question now is what bank is next in line to be sacrificed, who will be consolidated by the central bankers, how many and how quickly will they be wiped out. 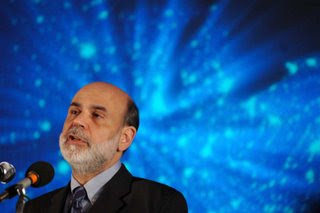 But most important, how many more dollars is Bernanke prepared to print? Brace for impact, the dollar is sliding and helicopter Ben is on the move.